Welcome to a new adventure with Nate Rocks! In this book, we may get less of Nate Rocks’ adventures and more of Nate’s adventures, but, this does not make the book any less fun and interesting. I was really happy to see Nate in action. Seeing him living in the real world, and less in the adventures he creates was wonderful! This book is perfectly created for the MG reader. In this book, Nate is going to summer camp. I remember the time I dreaded to go on one sponsored by my school. I dreaded being away at a new place, among new kids, and having to adjust to a completely new environment. I dreaded that I would not be accepted, would have to face bullies and I would end up doing something stupid or dangerous. Nate also has to face all these things. But, add to it the fact that is elder sister is going to the same camp, and it gets a whole lot worse. The only solace is that he has his best friend along with him. I can imagine, and somewhat remember going through the same problems that Nate does in this book. Every kid wants to be accepted in school and at camp. Most boys, including me, who have an elder sister feel that their sisters are out to get them. Also, we have all been bullied by someone at some point when we are that age (well almost everyone). I liked all the small details which the author adds to help create the perfect image of every scene in the book. The car ride to the camp, the arrival, the departure of the parents, meeting other boys in the camp, the really hyper camp supervisor, and all the activities at camp all seemed to come to life in the book. It was like I was right there, alongside Nate, experiencing each and every up and down he was going through. And, I enjoyed every minute! I did miss the consistent banter between Nate and Lisa. Wonder if I can call it that? That was a highlight of the first book for me, as it made me remember the times I had with my sister when I was that age. I have to say that I missed Lisa too, the haughty neighbour and Nate’s nemesis. I think Abby and Lisa made the first book so much more interesting! But, the new characters introduced in the book did make up for their absence. And, I have to say that there are some wonderful new characters in this book. Jerry and Tasha, the camp owners, Matt, the over-enthusiastic counsellor and No-Neck, the really burly kid who is Nate’s new nemesis in the absence of Lisa were all incredibly nice and at times funny. All the other kids introduced at camp made it come to life, and got it buzzing with activity. Like any good book about summer camps, there is a big event in the end in which all the camp bunks have to compete. As Nate goes up against his sister, there were bound to be fireworks and a well-fought and really close finish. I have to say that the way in which the event ended was something which I had expected all along, so it was a kind of let-down as I seemed to have known the twist which was coming. But, that is just me! I think the children at whom this book is targeted are going to love it. The ending of the book is perfect. As with the previous book, it ends on a happy note and with one of Nate’s real adventures. I really liked it that Nate’s parents thought things through before giving in to one of his demands, even though he may have deserved it due to his heroic deed. I really do hate it when parents are shown to have no backbone and just fall over each other to fulfil every demand of the kid. That reminds me so much of Dudley from Harry Potter. I also loved the fact that in the end, all the kids, whether they fought, or were mean to each other, or called each other names, became friends. That is simply a great message, that if you take the time to get to know someone, there is a chance you may change your initial impression and start liking that person, and even become their friend. This is exactly how I expect every great MG book to end. Definitely recommended for children or the child hidden in all adults. 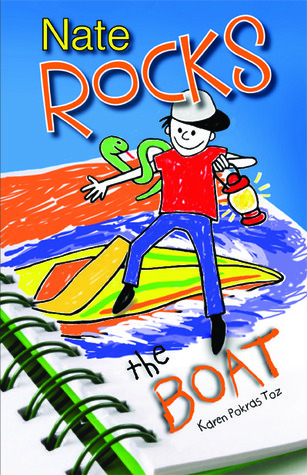 This entry was posted in Book Reviews and tagged Abby, Adventure, bullies, Dudley, elder sister, Harry Potter, Karen Pokras Toz, Lisa, Middle Grade, Nate, Nate Rocks, Summer Camp, Vacation. Bookmark the permalink. Thank you so much Ritesh! I’m so glad you enjoyed it – and don’t you worry – Abby & Lisa are back in full force in the next Nate book!